I had spare time this morning around the city and took heaps more photos of the river and weir. The shape is very cool and with the bridge in the background is just begging to be photographed. 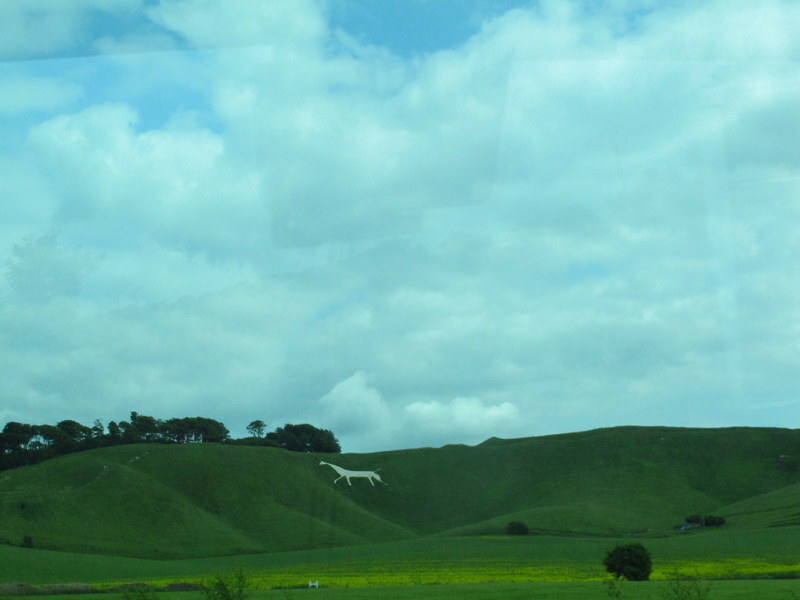 Then it was on the bus to Marlborough, where my Dad was born. His dad was in WW1 and at the end of the war, instead of being sent home to Australia straight away, was billeted to a farming family near here. He obviously met my Grandma, Violet Chandler, they married, Dad was born and when he was 6 months old Grandad took them home to Australia. My poor Grandma, I often think about her, coming from quite a refined family in beautiful green England, to living in a tent in the wilds of Queensland. Dad told me once that on lots of occasions, after storms, she scoured around where they were living for hours looking for her bits and pieces that had blown away. As a kid I loved her dresser with all the Willow pattern crockery stacked inside. I wonder now whether any of it came out from England with her and survived the tent years. Anyhow, enough reminiscing, I actually had to catch a bus from Bath to reach Marlborough, there’s no train service there. It was once a major market town, but now is probably more famous as where Kate Middleton attended high school, at Marlborough College. A few of the people on the bus pointed things out to me along the way, they were all pensioners who’d been to town for the morning and were heading home again. They’re all very lovely and want to know all about my travels, where I’ve been and which places I like best. One of the women who was sitting near me was telling me she has never been to London, and she’d have to be in here 70’s! I got a photo of one of the famous white horses because one of the women pointed him out for me. I was also lucky enough to grab a photo of a funny little brick bridge thing over the road that joins buildings on both sides, very unusual and cute. My hotel was just across the road from the bus stop in the high street, so no worries about finding my way today. When I booked in, the girl said, ah, you’ve got the party bathroom!! Didn’t know what she was on about until I saw it, but she was completely right, you could have a party in there. Up to the party bathroom! The pub is gorgeous; to get to the bedrooms, you go through a little door in the bar and up a couple of flights of weeny curving stairs that are all uneven and cramped. But then, walking around my room just about made me seasick – it was so up and down. 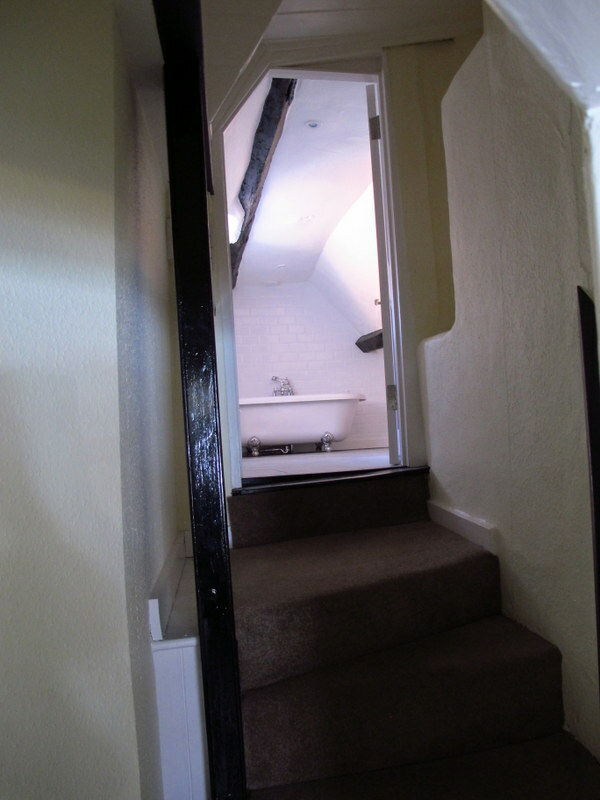 It’s difficult to explain but it was just hilarious, the bed had 6″ chocks of wood under the legs at one end to try and even it up and every time I went up or down the stairs to the party bathroom I stumbled because something was weird about the spacing. Every time I did it, I chuckled to myself and said, next time I’ll remember that, but I never did. For all the wobbly bits, it was a lovely old place and the staff were all nice, friendly, helpful girls, it was a real treat to stay there. So, first thing was to go look for Chandlers Yard because I remember when Mum and Dad visited they had photos taken there. It couldn’t have been easier to find either, almost directly across the road from the hotel and the back of the building still looks the same as it did in their photos. The building that faces on to the high street was Grandma’s family’s saddlery shop years ago. How strange is this, it’s now a book shop, so of course I had to have a look around and I even asked the woman there if she knew any of the history of the building, but no luck there. So…. as I was looking around, I found a book written by Jesse Chandler and updated by his son David!!! 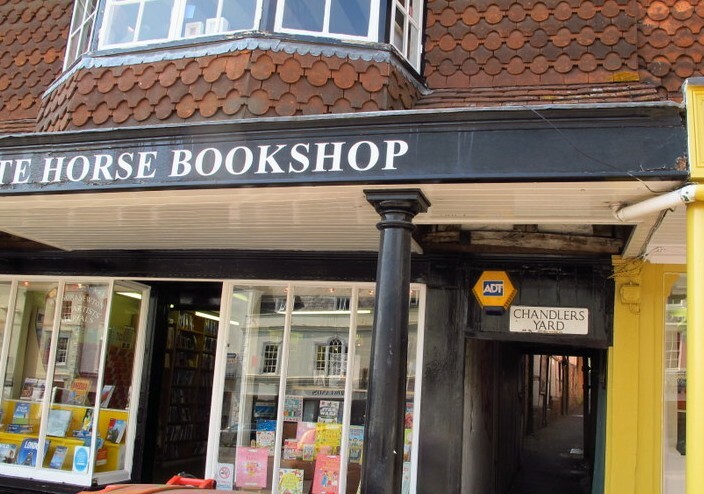 It’s a book about place names and short walks around Marlborough. Wow, imagine my joy, a real life link to my Grandma’s family. Of course, I bought a copy and asked the woman if she knew if David still lived around Marlborough. She was a bit coy, but I guess, I could have been some crazy axe murderer or something, so I toddled off to the library to see what else I could find – I’ve often said I’d make a good detective! Not long later, I came up with his address and phone number, made a call, explained who I was and organised to meet him and his wife later that night for a drink at the pub, how cool was that, I was stoked. David and his wife Jo both came and had a drink at the pub then invited me to their house for coffee – in the next little lane, about 20 steps from the pub, you just wouldn’t read about it would you? What an awesome day, couldn’t ask for more. Oooh look, we can’t go any further! What a delightful post, Julie………. left me tearing up when I saw you standing just where Pop had in a photo from quite away back. He would have been over the moon to think of your joy from being there!! 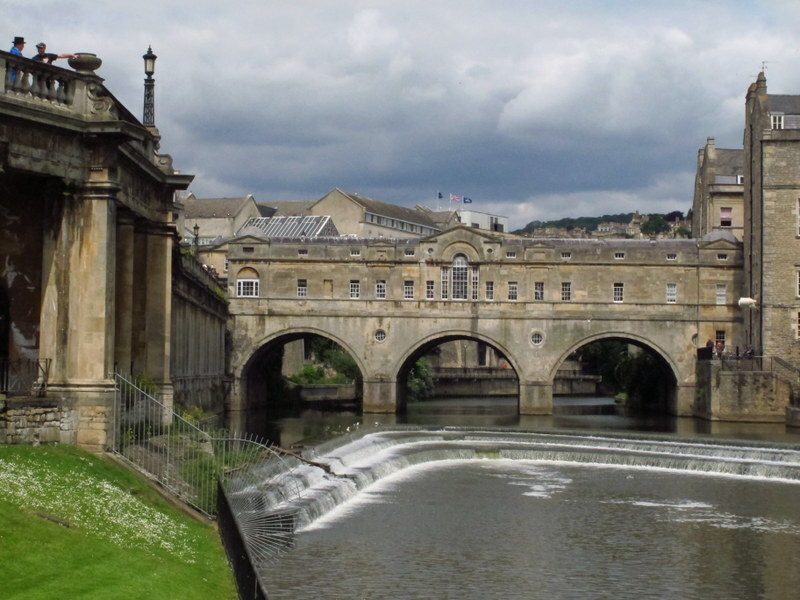 Your Bath circular weir shots are really special too. Hadn’t quite realised that David Chandler is a 2nd cousin – so very closely related. Top work, and to think it was all pure pleasure!! It was pretty special to find that lane and accost some poor lady to take my photo there, I was a bit teary at times in Marlborough too. This sounds like a wonderful day. I recently had the opportunity to be in London for a week. On of my favorite days was a trip to the Cotswolds. Such beautiful country. I host a weekly link party called “Oh, the PLACES I’ve been!”. I’d love to have you join. The link goes up at 7 pm EST on Thursday evenings. Hope to see you then. Thanks for the invitation, maybe when I’m home again I’ll have time to join in, will definitely pop over and have a look. G’day, It would appear that we are related as my Great Grand Father Albert Chandler was the Saddler in the shop where the book shop now is. His daughter married my Grandfather Jones. I was born in Burford and our family came to Australia in 1947. Love to hear from you. Hi Summer, sorry for my totally delayed reply, sometimes I just can’t seem to fit everything into each day. How wonderful, I’ll have to look when I get home to see what relation your great grandfather and grandmother were to my Grandma. How marvellous is the internet, that you happened across my mention of the Chandler family. Will definitely keep in touch.